We all have seen trains rolling by neighborhoods across the nation carrying everything from soy beans to televisions to hazardous materials, such as liquefied petroleum and ethanol just to name a few, but what happens when that train leaves the tracks in your neighborhood? Who trains the first responders to know what materials are what and what types of cars carry what materials? 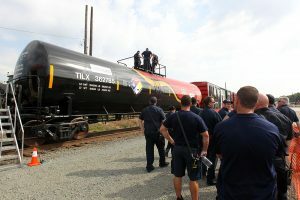 Well, Norfolk Southern, through their Operation Awareness and Response team, or OAR launched a systemwide training train in April of 2016 that now has a dedicated locomotive, 2 boxcar classrooms, 4 tank cars and two specially equipped flat cars to help all first responders get that additional hands on training needed in case of derailment. “The NS hazmat safety train is like a rolling classroom, delivering hands-on training directly to emergency responders in communities along our rail lines,”said David Schoendorfer, Norfolk Southern System Manager Hazardous Materials. What is unique about the train is the ability to put your hands on each type of value that is located on top of tank cars as well as see some of the various types of intermodal containers that are traveling on flat cars across the system on a daily basis. This type of training just cant not be duplicated inside of a classroom and these four hour classes are an essential part of getting the local responders the know how to make the right moves in an emergency situation. In 2015, NS provided training for 4,792 emergency responders, government officials, members of the media and others in 18 states. This was one of the largest initiatives by any of the Class One railroads under the TRANSCAER program to date. Most of the first responders are able to grab information vital to safety on railroad property and how to communicate with train crew employees when a derailment or incident occurs. Locomotive fires are also discussed and a chance for first responders to see inside the locomotive to know where fuel shut off valves are located on the side of the engine as well as in the cab if necessary. All of this is very important information in situations such as locomotive stack fires and or containing fuel spills in the event of a derailment. All of the information on this train and the training provided to your city can be found on the website.